In 2005, Casino San Pablo promised to provide good jobs with good benefits. The Casino made $200 million a year in 2011-2012 – but its workers have had a wage freeze for 4 years, and more and more of them are working part time with no benefits! Casino San Pay-LOW has BROKEN ITS PROMISES! Come present the Casino with the WORST BOSS OF THE YEAR award – and a stocking of coal! HERE WE GO AGAIN, EVERYTIME WE TURN AROUND NOW ITS ONE BLACK LIFE AFTER ANOTHER ASSASSINATED, JUSTIFIED, AND SWEPT UNDER A RUG, WE DEMAND JUSTICE FOR RENISHAS KILLER AS WELL AS ALL PEOPLE KILLED UNJUSTLY BY SO CALLED PROPERTY DEFENDERS AND WANNA BE LAW ABIDING CITIZENS. WE DEMAND TO KNOW WHY THEY DIDNT GET A POLICE CALL UNTIL HRS LATER, THEN FOUND HER BODY. WE SAY NO JUSTICE, NO PEACE!!! WE IN OAKLAND KNOW FAR TO WELL THE INJUSTICES OF MUREDRS THAT GET SWEPT UP UNDER THE RUG. THIS SYTEM LIES AND PROTECT EACH OTHER AGAINST MURDER ALL DAY IN THIS COUNTRY. WE IN OAKLAND KNOW THAT INJUSTICE IS A GLOBAL EPIDEMIC. ALL FAMILIES AND SUPPORTERS OF MURDERED VICTIMS OF VIOLENCE ARE ENCOURAGED TO COME OUT AND SPEAK. BRING BANNERS, POSTERS, SIGNS WHATEVER YOU LIKE. IN SOLIDARITY WITH DETROIT, WE WILL HAVE A SPEAKOUT, MARCH, AND RALLY THROUGH THE STREETS OF EAST OAKLAND TO EXPOSE AND BRING AWARENESS TO THIS GLOBAL EPIDEMIC DUE TO THE FACT THAT OUR COMMUNITIES ARE SUFFERING FROM LOSS OF LIFE SO MUCH THAT SOME OF US HAVE GOTTEN IMMUNED TO DEATH. **** WE WOULD ALSO LIKE TO MAKE A VIDEO OF THE RALLY AND MARCH TO SEND TO RENISHA FAMILY MEMBERS AND SUPPORTERS. WE WILL ALSO BE HAVING ONE ON ONE INTERVIEWS FOR FOLKS WHO WANT TO SEND THEIR OWN PERSONAL MESSAGES OF LOVE, SOLIDARITY,AND SUPPORT. CHILDCARE PROVIDED!!!!! PLEASE BRING KIDS, KID-FRIENDLY!!! PLEASE COME OUT TO SHOW RENISHAS FAMILY SOME LOVE AND SUPPORT. Chelsea (formerly Bradley) Manning is the US soldier sentenced to 35 years in jail for leaking thousands of documents to Wikileaks exposing US and other governments’ war crimes and corruption. She is 26 years old on this day. Ever since she was detained and tortured in 2010, international protests, including from LGBTQ people, have demanded her release. Demonstrate your support for her courageous whistleblowing, and for all who blow the whistle on corruption, dictatorship and dirty government secrets. Join Eviction Free San Francisco and all allies in the fight for housing justice in San Francisco as we take on a landlord (to be named at the action) in San Francisco’s Mission District. We Say “HELL NO” to the displacement of seniors, artists, immigrants, and workers from this vibrant, diverse, working-class Neighborhood and citywide! Join two long – time San Franciscans (one disabled senior) who refuse to leave the city they love! By standing up for this household, we stand up for all of our Mission homes…all of us together!! On October 22nd, Andy Lopez, a 13 year old boy was shot and killed by deputy Erik Gelhaus,(a supposed firearms expert that writes columns for many militia magazines) who says he mistook the toy gun that Andy was carrying for a real rifle. The deputy ended up shooting 8 rounds – 7 hitting and killing Andy. 2 months later, no justice has been served, initial findings from the Sheriff’s Department show that the deputy acted according to procedure in his use of deadly force, and on December 10th, Gelhaus returned to administrative work at the Sheriff’s Department. Information source and livestream info. 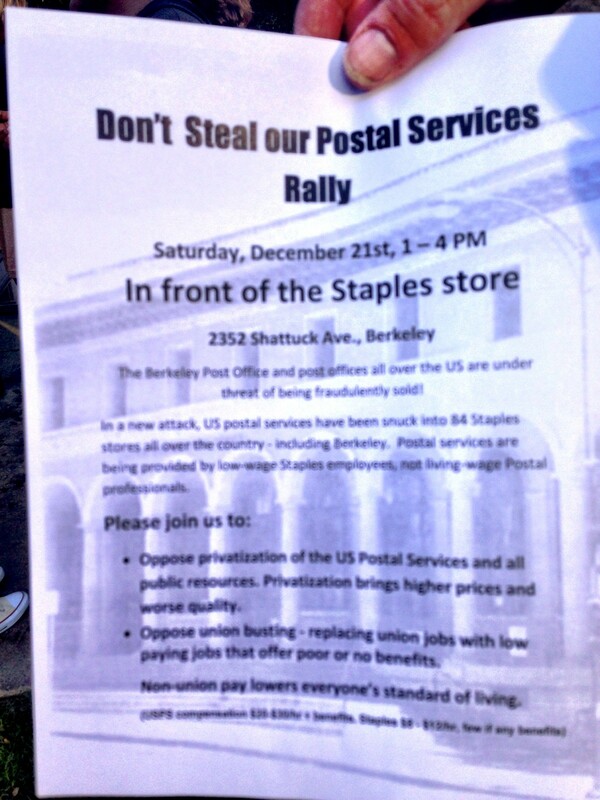 The Berkeley Post Office and post offices all over the US are under threat of being fraudulently sold! In a new attack, US postal services have been snuck into 84 Staples stores all over the country – including Berkeley. Postal services are being provided by low-wage Staples employees, not living-wage Postal professionals. Oppose privatization of the US Postal Services and all public resources. Privatization brings higher prices and worse quality. Oppose union busting – replacing union jobs with low paying jobs that offer poor or no benefits. Sponsored by Berkeley Post Office Defenders. Supported by Strike Debt Bay Area. This will be the 100th anniversary of the founding of the Federal Reserve. Monday evening from 6 – 9, OccupyForum will hold its meeting at the FED (101 Market) and have a panel of speakers. There are some Scheduled events. – Blankets: We’re asking everyone who can to drop by a Goodwill or Salvation Army or thrift store and get a blanket (they’re cheap! a few bucks)… The idea is to keep warm while we’re there and then leave them in the free pile for folks who need them. The FEDERAL RESERVE BANK (commonly called the Fed) and Wall Street banks create just about all the money we use every day. Most people think that the Fed is an agency of the Federal Government. But it’s not. It’s 100% owned by the largest private banks in the US. The Fed uses its incredible power to decide how much new money to create and, more importantly, where to spend it, to benefit the Wall Street banks. Since most of us think new money is generated by government, we would also expect that money to be directed toward things that benefit all of us such as highways and other infrastructure, education, health care and social security. However, all money the government spends has to be borrowed at interest from the banks and the Fed. The banks and the Fed create this money, instead, by investing in areas that will provide them with maximum profits – usually wars, the coal and oil industries and real estate. This results in crashes like the current one which started in 2008, and depressions, and no consideration is given to the moral or environmental costs of these investments. Profits over people as usual. The Fed operates largely in secret, and is not required to be accountable to anyone. There has never been a proper audit of the Federal Reserve Bank. The power to create money is arguably the most important single power in the US economy and yet the people have no control over it! It’s time to shine a light on the workings of the Fed. We need to start discussing solutions like making the Fed accountable and handing over the power of money creation to the Federal Government! This could be the single most powerful way to create a more democratic economy that serves the interests of all of us – not just a few who profit immensely off of our labor. 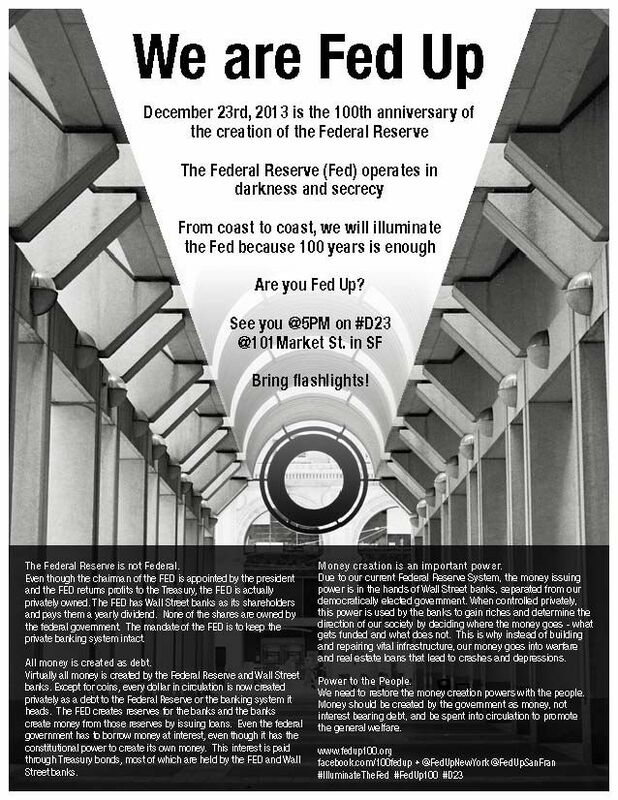 Join us this Monday, Dec. 23 at 5pm on the Federal Reserve’s 100th Birthday when we will Illuminate the Fed! opposing the suspension of Korea Rail Workers, the attack on their union and in support of their struggle against privatization. Similar schemes also threaten transit workers and public workers in the Bay Area including the ongoing attack on ATU 192 AC Transit workers and BART ATU 1555, SEIU 1021 and AFSCME 3993. This attack was directly connected to international companies like Veolia who are privatizing transit services in complicity whith state governments run by both Democrat and Republican Parties, are pushing to outlaw strikes and collective bargaining. Come out and march on January 1st at 3pm starting at 24th street BART Plaza and ending at 16th street BART. On January 3 a revised deal with Barclays bank will go before the bankruptcy judge in Detroit. This deal that slightly improves the original one, will still exempt Bank of America and United Bank of Switzerland from the bankruptcy process that threatens Detroit workers pensions and the assets of the people from art, to water and parks. Demo at BofA near Fruitvale BART at noon to support Detroit. (They are demonstrating at the courthouse Friday am and then going inside to pack the courtroom.) 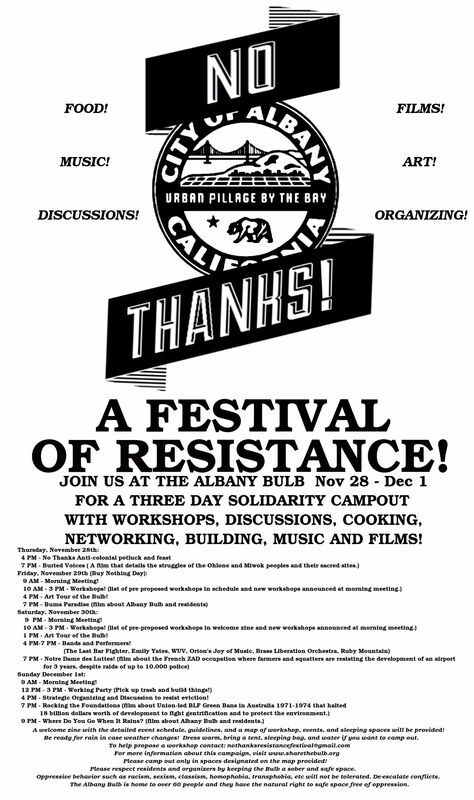 NY is working on a demonstration near Wall Street for Jan. 3, as well. Facebook event, RSVP and more info. Mothers in White will pleasd for justice for Andy at the January 7, Tuesday, meeting of the Sonoma County Board of Supervisors, at 1 p.m.
A bi-lingual flyer about the event includes a photo of Andy’s parents Sujey and Rodrigo over his coffin. Mrs. Lopez apparently plans to attend the event and may speak to the supervisors as a mother whose innocent son was killed by law enforcement. The committee reported its intention to “create a dramatic visual impact” of at least 50 Mothers in White, as well as their allies, including men in white and the group Women in Black, which has appeared on street corners around the world to bear witness to those killed by violence. People are invited to bring mirrors to hold up to the supervisors to examine themselves. Supervisor Mike McGuire apparently said that Andy’s death was a time to reflect in the mirror. This peaceful event intends such a reflection. The color white was selected because it was Andy’s favorite color. White is not the absence of color, but the mixture of all colors, which is what this mass movement for justice seeks. Thomas E. Wheeler, recently appointed by President Obama as Chairman of the Federal Communications Commission (FCC), will be speaking in Mountain View and Oakland, CA on Thursday, January 9. Join planned protests and speak out against increasing wireless health damage. Wheeler will be speaking in Silicon Valley at the Computer History Museum – 1401 N. Shoreline Blvd. in Mountain View. Protest outside starts at 11am, event is from 12-1pm (it is a free Commonwealth Club event and is now open to the general public.) You must sign up in advance here. Community Rally and March to City Hall. Stop the Crude Oil Storage and Raily Transfer Facility. Keep Pittsburg safe and healthy. We need to be righteously angry. we ain’t gonna tolerate this.